Design-led. Digital-first. At Brosa, we embrace technology to create a personalised experience. Innovative and agile, we bring the furniture and homewares brand of tomorrow, today. Less cost for the environment. Less cost for you. Here at Brosa we believe in going direct and cutting out excess costs, which is how we’re able to deliver amazing designs at accessible prices. Traditional furniture retailers typically have many middle men standing between the production process and you, the customer. Every middle man adds extra costs and extra inefficiencies. 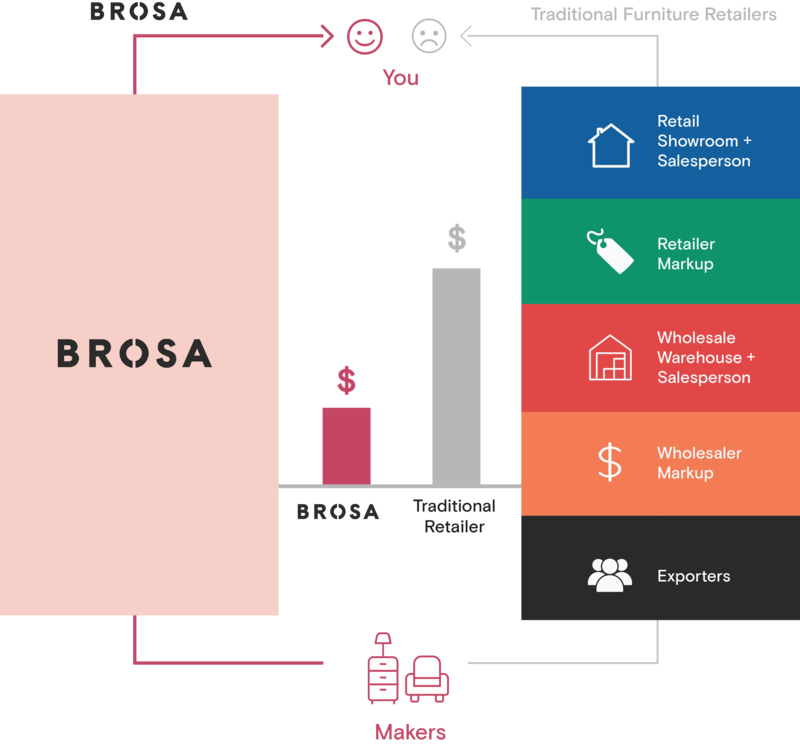 This is why at Brosa we focus obsessively on streamlining this entire process and cutting out middle men so customers can enjoy beautiful designs at exceptional value. What is a Traditional Retail Price? On each of our product pages you will see a “traditional retail price”. This represents the estimated regular retail value of a comparable item of similar quality that you can purchase from other retailers. All our products are available exclusively through our site so the retail price may or may not represent the prevailing price of any specific comparable item at any particular time or in every location. We make no promises about the reliability or accuracy of any such information. As a result, your actual savings may vary. We regularly research the market to ensure that these traditional retail prices represent realistic prices on comparable items but nothing can replace your own comparison shopping and if this is an important factor for you in deciding to purchase then we recommend conducting your own individual research. We seek to change the industry and consumer landscape by challenging accepted norms and providing a fresh take on the furniture and homewares category. We offer quality, because we believe that if something is worth doing, it's worth doing well. We offer choice, but we believe in something for everyone, not one size fits all. We offer value for money by cutting down overheads, and cutting out high-street margins. We offer the most current styles, technology, products and services by focussing on being both of the moment, and in the moment, too. We offer the best, to the most, for the least. As the digital age evolves, so do we. Our vertically integrated model works hand in hand with our custom technology. Every product is stamped with a serial number, added to our online database and constantly quality checked from start to finish. At Brosa, quality isn’t just a word. It’s the word. We aim for the best because our customers deserve the best. But how do we know what the customer wants? By striking the perfect balance between creativity and data. Simply put, we understand what customers want using powerful technology. Every stage is enhanced with software. Using machine learning algorithms for stock ordering, customers get products they want in stock, and delivered in time. Data science, software and creativity at its finest.